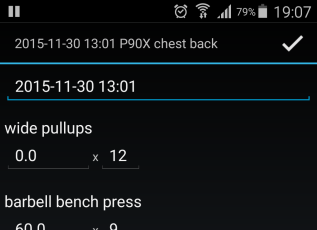 It’s been a long time since the last update of BB Workout Log, but the wait is over. Meet the new version which brings a feature that many of you have been waiting for. When you start using BB Workout Log there is a natural desire to move at least few of past training sessions to the app, so that you would start with some meaningful data. Of course, you can enter copy performed sets with weights, reps and rest times from your notepad or Excel file, but the problem was that they all would be saved on the same date in the mobile app. Not any more! After entering a workout, go to History, select the training session and then select Edit from the menu. From there you will be able to set any date that you like. Of course, after such a long wait time, you’d expect more from me than one feature, so I also implemented better re-ordering of exercises in a routine. Previously after dragging an exercise the screen was reset back to the top, which was very annoying. Now it will remain in the same position for more user-friendly and logical experience.